So for years I have loved shopping, but not just regular, go into a store and shop...that was just too easy in my mom's eyes. We were not wealthy so we got creative. Most kids rejected thrift shopping, but for me, it was an adventure. Over the years I have really acquired a technique that I love sharing with all of my friends and this is my attempt to share it with all you lovely ladies...I also want you to share your steps, techniques, and secrets. Everyone has their own way of conquering a store and ALL ideas and techniques are needed when you venture off to your favorite one. 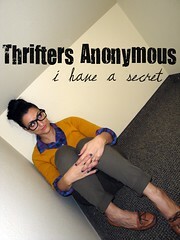 You can be an experienced shopper/thrifter or an amateur, the hope is we will help each other! I am going to make this a weekly series where I will share a step with you to help you in your quest for amazing finds. I named it Thrifters Anonymous, because it sometimes feels like I need to be around those who are as addicted. You know what I am talking about folks...have you ever tried going to a thrift store or any store for that matter with someone who has never been? It is soo hard and you then realize that there are certain types of people who really truly get it and together we form a unique club...If you are one of those individuals who feels overwhelmed, uncomfortable or wish you could find the things that everyone finds, than this is a perfect place for you, and if you are like me...let's share our tricks to help these folks out! I can't wait to meet all of you and find out some new tricks to make thrifting more efficient, effective, and well let's face it... I just don't want to feel like the only crazy loony tune sweating and racing to the next rack, spending hours upon hours searching for that perfect treasure. Oooh...thrifting is my favorite! I'm more proud of my thrift finds than my nice, expensive ones. i definitely need to go thrifting more. great idea! I can't wait to see what advice you offer up weekly though because I definitely want to try thrifting. I'm linking up!!!!! YAY! I'll add your ADORABLE badge to my blog now! Can't wait to share finds! Gotta hit up SAVERS today! Too cute! I will be following your blog to see what adventures follow! Love it! I love to thrift!